A personal, journalistic, and historical reflection on race, labor, and foodways in the American South. 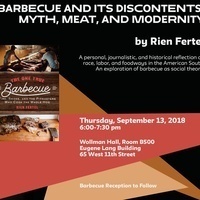 An exploration of barbecue as social theory. NSSR alumnus Rien Fertel (Historical Studies, 2008) is the author of three books exploring myth and memory in the American South. He lives and teaches in New Orleans. Barbecue reception to follow. Sponsored by The New School for Social Research. The William Phillips Lecture was established by the late Edith Kurzweil (NSSR, Sociology, 1973) in honor of her husband and Co-Founder and Editor of the Partisan Review - a magazine committed to freedom of thought in literature, creative expression, and serious, open debate. Humanity, Society, Social Justice, Race In The U.S.